The Zondervan Biblical and Theological Lectures series provides a unique audio learning experience. 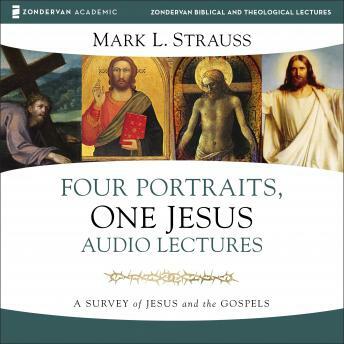 Unlike a traditional audiobook's direct narration of a book's text, Four Portraits, One Jesus: Audio Lectures includes high quality live-recordings of college-level lectures that cover the important points from each subject as well as relevant material from other sources. To Christians worldwide, the man Jesus of Nazareth is the centerpiece of history, the object of faith, hope, and worship. Even those who do not follow him admit the vast influence of his life. For anyone interested in knowing more about Jesus, study of the four biblical Gospels is essential. Four Portraits, One Jesus is a thorough yet accessible introduction to these documents and their subject, the life and person of Jesus. Like different artists rendering the same subject using different styles and points of view, the Gospels paint four highly distinctive portraits of the same remarkable Jesus. With clarity and insight, Mark Strauss illuminates these four books, first addressing their nature, origin, methods for study, and historical, religious, and cultural backgrounds. He then moves on to closer study of each narrative and its contribution to our understanding of Jesus, investigating things such as plot, characters, and theme. Finally, he pulls it all together with a detailed examination of what the Gospels teach about Jesus' ministry, message, death, and resurrection, with excursions into the quest for the historical Jesus and the historical reliability of the Gospels.